A lot of companies sell luxury yacht charters, but Virgin Island Sailing is the only company whose in-house experts regularly book more crewed yacht charters and bareboats in the Virgin Islands than any other broker in the world. 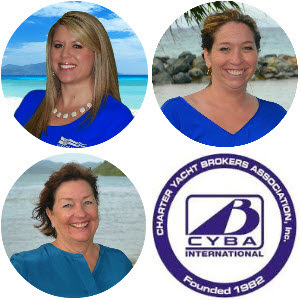 Our brokers have more than 80 years combined experience organizing Virgin Islands yacht charters, crewed sailing charters and barboat vacations through out the Caribbean. Many brokers can tell you about yachts that are available in these places, but only brokers with our extensive experience can tell you which yachts and crews are better than others. That’s the kind of insider information you need to get the most for your vacation money, and it’s the kind of information that only Virgin Island Sailing can provide. Emily Mack and Ellen Stewart brokers for All Inclusive Yachts with Crew. Joann Higgins and Kelly Plas for Bareboats in the BVI and Worldwide. Emily Mack and Melody Delgado for Megayachts, Superyachts. Contact us today and see how the team at Virgin Island Sailing sets the standard for booking Yacht Charters and Sailing Vacations.